Writing Perks | Does This Font Make Me Look Fat? There are a lot of perks going on this week, all related to writing except my trip to my Baltimore dentist on Tuesday. On Tuesday night is Working Writers’ Forum. We meet once a month to critique each others work. This group has been ongoing for seven years and I met Laura when she joined the group about five years ago. Over time we’ve lost some members, and gained new ones. Because I was a psychotherapist for many years, it has always seemed to me this was a lot like group therapy. Once a group has bonded it is very hard to let new people in. After all, you’re going to be spilling your guts to these folks. There needs to be a high level of trust. Critique groups operate the same way. We last welcomed new members to the Working Writers’ Forum about three years ago so the trust level is back to high. We aren’t unveiling our psychic flaws, but are putting our creative energy out on the table to be picked over. It might be worse than group therapy. Laura and I have submitted a third draft of the first twenty-five pages of a screenplay we have been working on. Having seen the first two drafts, the feedback from the group is that they’re enjoying being able to see the evolution of this project. On Thursday night Laura and I will be at Fisherman’s Inn on Kent Island selling our books. We did this last year in another nearby location and booze and book buying seemed a good pairing. Our thanks to friend and fellow critiquer, Brent Lewis, for doing the heaving lifting on the organizational end. We’re just showing up with our books. I wonder if Fisherman’s Inn will put my wine in a sippy cup like they did at Bridges Restaurant last year after I almost ruined Laura’s stack of books. 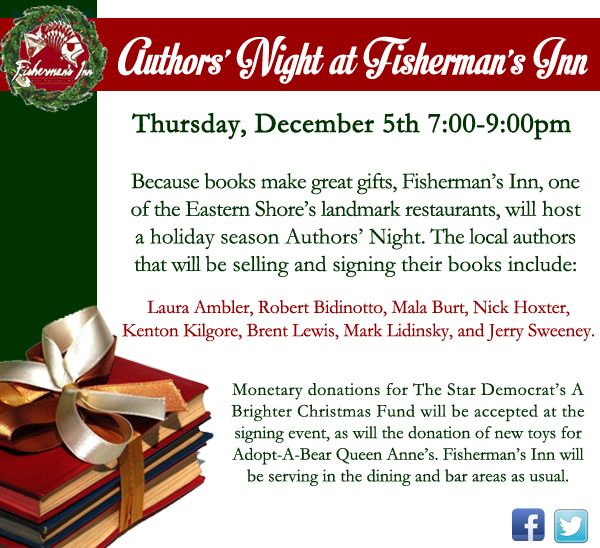 Fisherman’s Inn on Kent Island hosts an Author’s Night. 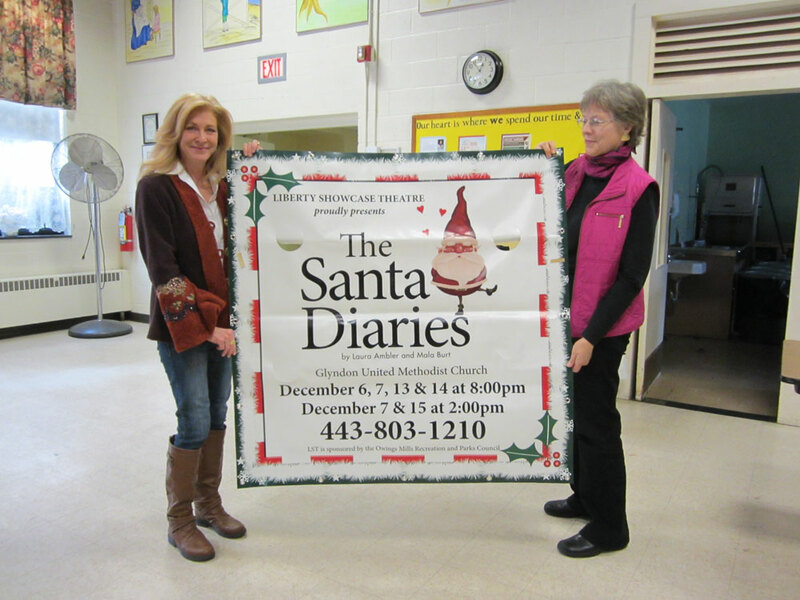 Then on Friday night the second rendition of our play, The Santa Diaries, opens in a production by the Liberty Showcase Theatre. They don’t have a permanent theater home so this production is being performed in the hall of the Glyndon Methodist Church. Community theater the way it often is. We are excited to see how Liberty Showcase will put their own stamp on the play. Laura remarked that, “Liberty Showcase’s mission fits right in with the story of what happens when a successful and self-absorbed Hollywood actor is forced to return to his hometown and direct the community holiday play. In the process he rediscovers the joy of Christmas, a lost love, and learns to embrace his inner Santa.” (disclosure – that last bit was copied from a press release we wrote). Since Community Theater is one of the themes of our play, this venue is perfect. If you live anywhere near Glyndon, come out and see the play. Performances dates are as follows: Friday, December 6th and 13th at 8PM; Saturday, December 7th at 2PM and 8PM; Saturday, December 14th at 8PM and Sunday, December 15th at 2PM. The venue is Glyndon United Methodist Church, 4713 Butler Road, Glyndon, MD 21071. For tickets visit the Liberty Showcase Theatre website at http://www.libertyshowcasetheatre.org/. The following week we might actually get back to putting new words on paper, but critiques, book sales events and opening nights need to be celebrated as some of the perks of the writing life, which can often be a lonely experience – unless you have a writing partner.